Ever heard of a band that practices on a pontoon boat?! This may be one of Towering Pines’ best kept secrets! Campers with various ability levels have the opportunity to try different instruments and be part of TP’s very own music group. Guitar and band workshops meet a few times each week for evening activity. Workshops are led by 2-3 talented musicians and meet out on the pontoon boat or in the boathouse of the sailing area. 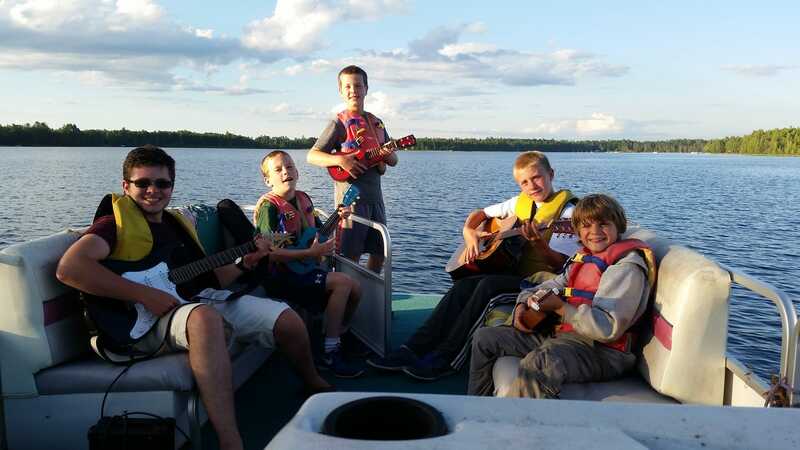 Lake Nokomis is the perfect spot for inspiring musical interests! 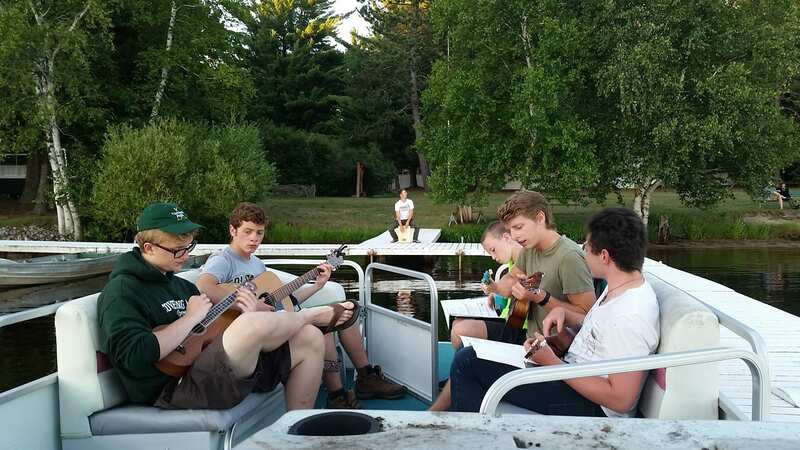 Some campers bring their own instrument from home to play such as a guitar, a ukulele, or harmonica. We also have instruments campers can borrow if they want to try out their musical aspirations for the first time while at camp. The ukulele has been very popular in the past because it is not too tough on the fingers and is pretty easy to learn. Some boys like the ukulele so much they return the following summer with their own. We have also discovered that rhythmic instruments can be made out of almost anything and add depth to our music. The back of a guitar or ukulele, a couple of sticks, a Cajon (a box you sit on while slapping the sides with your hands), and a chicken shake (a plastic egg filled with small metal balls that acts like a maraca) are great for this purpose. This past summer there were 2 different bands- the Totem Poles and Pontoon 7. Both bands practice during the week and have the opportunity to perform at Vespers on Sunday morning and campfire that evening. For a Sunday night campfire in 2016, the Totem Poles played a song called “7 Years” while the Pontoon 7 performed “Twist and Shout”. We are looking forward to seeing what 2017 will bring on the music front and hope to see returning and new band members join us on the rippling waters of Lake Nokomis!